Thanks to voluntary water harvesting measures by a few, as well as legislation-led RWH by the others, many of Chennai's open wells have sprung back to life. The bountiful rains of 2005 showed that where conservation efforts are in place, even a single season's rainfall can largely restore water security. Shree Padre reports. Bayview Apartments, a multi-storeyed residential complex located in Besant Nagar, Chennai consists of 140 flats in five blocks. Each block in the complex, which was built in 1988, has an open well. Since the community was able to access sufficiently good water within its premises, the residents have been meeting their needs with this well water, and have skipped going to the Chennai Metropolitan Water Supply and Sewerage Board (CMWSSB) for their water connection. Skipping the municipal supplier's services has made the residents prone to a higher risk of being without water, but they have managed so far. In 1999, the open wells went dry. Two shallow borewells per block, 45 to 50 ft. deep, were dug. There was reasonably good water in them. And the very next year, all the open wells were also further deepened by 20 feet, taking their total depth also to 44 feet each. And this arrangement sufficed for the next few years. In fact, though the wells were deepened, from 1999 onwards, they used only the water from the bore wells. But in 2004, however, the borewell water began to turn brackish, and thus unfit for cooking and drinking. The residents had to purchase so-called 'mineral water' in 20-litre PET cans. Each 20-litre can costs between Rs.20 and Rs.50 depending on the brand, and lasts four to seven days. Thus, each family spent thousands of rupees each year buying water for their cooking and drinking needs. And for everything else, they continued using borewell water. Sekhar Raghavan, a veteran rainwater harvesting activist, lives in this apartments, and his persistent efforts have helped keep the apartment community ahead of many others in preparing for shortages, and also in preventing them in the first place. In 2000, much before it was made mandatory by the government, this complex had extensively implemented rainwater harvesting (RWH). The rooftop water was led into the open wells after filtration. The driveway runoff was intercepted near the gates and injected into recharge wells - each three feet in diameter and 10 feet deep - covered with perforated RCC slabs. And since the road level here is higher than the site level, rain falling on the road would also flow into these recharge wells. This was a bonus! Bayview Apartments, thus deposited all the rain water it received in mother earth's bank! Following the legislation that made RWH mandatory in 2002-2003 all houses in Besant Nagar, like elsewhere in the state have implemented it. Thanks to voluntary RWH measures of Bayview Apartment and legislation-led RWH by all the residents around, coupled with the city's record rainfall of 2005, the open wells, which were almost dry for seven years turned alive in 2006. They were three-fourths full! 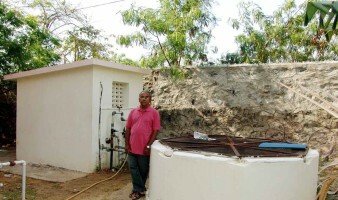 Recalls Sekhar, "When all our wells dried in 1999, I was still hopeful that they would one day come back alive. But I did not expect it to happen so quickly." In Bayview apartments, all the 140 families living here have now gone back to the well water for everything except drinking. Thirty per cent of them are using it even for drinking. Why only 30 per cent? Sekhar has a ready answer. "Using mineral water is an addiction. Seventy per cent of our residents still continue to buy it, though it is unnecessary. They were earlier using it for both drinking and cooking; now its use is confined to drinking only. For all other purposes well water is used." Bayview hasn't yet stopped using the bore wells, either; about 20 per cent of the requirement is met from this source, and even this water has been quite good of late. It is not only the quantity of water available that has improved since the rains of 2005. The brackishness of the water, which was evident not so long ago, also has reduced dramatically. Points out Sekhar, "The TDS (Total Dissolved Salts) of our groundwater is now 500 parts per million (ppm), implying very good quality." "When all our wells dried in 1999, I was still hopeful that they would one day come back alive. But I did not expect it to happen so quickly." In the wake of that good monsoon, Sekhar had conducted a survey on increase of groundwater in Chennai as a result of mandatory RWH. Says he, "The average rise in the water table in the last three years was six to eight metres." Some other interesting outcomes: Only 50 per cent of the residents had really understood RWH and had done a reasonably good job. The remaining 50 per cent had done it only to comply with the law and to avoid the punishment of disconnection of municipal water supply. A majority of the residents did not even know what RWH structures are all about, and where they were located in their premises. Only 20 per cent of the residents had voluntarily harvested the driveway runoff too within their premises. The others were content to harvest only the runoff from their rooftops. Sekhar received some very inspiring feedback to the survey. He adds, "I did hear of dry wells coming back alive from a few other residents in other parts of the city as well. One resident informed me that his well, which had remained dry for almost 35 years, came back alive." Even while digging these shallow bore wells way back in 1999, a lot of precautions were taken. Water samples were tested every foot during digging. Why this precaution? "Because of the close proximity of our apartment to the sea", Sekhar explains, "fresh water floats on salt water and there is an interface. One does not know till what depth the fresh water aquifer extends and where the interface starts. As such, we have to be very careful while digging. If we dig up to and beyond the interface then brackish water would mix with the top fresh water making all the water brackish." 4, Third Trust Link Rd. "Living close to the sea is as dangerous as it is beautiful," he warns. "The aquifer is like a goose which lays golden eggs. People should not be greedy and over exploit groundwater. Some feel that it has already gone bad and it would never improve, and so they over exploit. To such people I would like to say that the more it has become bad, the lesser should be the extraction, and only then it would improve. People should learn to live not only with less water but also of different qualities for different end uses." As the director of Rain Cenre, Chennai's one-stop information clearance house on urban RWH, Sekhar is spending his time spreading awareness. According to him, "it's time for a Save the Wells campaign to protect our open wells from people who are keen to close them. Many people have a wrong notion about open wells. In cities, once a family gets tap water, their open wells are either abandoned or filled up. Another important group is the Vaasthu group, which suddenly realizes that well is not located in the proper place namely, north-east corner of the plot and wants it to be closed. For those people who feel that a dry well is of no use and hence it should be filled up", advices Sekhar, "our story can be an eye-opener. An open well can and will come back alive with RWH and a fairly good monsoon for even one year. I have been telling residents of my area not to fill up their open wells. It can always be used as a recharge well. If not, we have to spend several thousand rupees to create a recharge well." If there is one arena in the city where his efforts have had little reward, it is the government itself! After legislating that each of the residents do something to harvest their water, it appears to have closed the book. The city corporation has not done anything to harvest water in the open areas under its control. The runoff is channelled to storm water drains constructed on one or both sides of the road, discharged into the nearby river and ultimately to the sea.